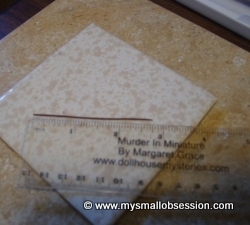 Bonus Video Tutorials at the bottom of this page ~ More cookies, cookie sheet, cookie jar & more! 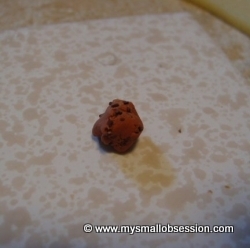 Roll out a thin snake of the chocolate colored clay and bake for approx. 10 minutes, according to package directions. 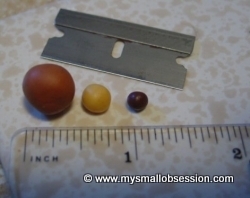 Allow to cool then chop into small pieces with a sharp razor blade. Tip: To bake polymer clay, you need an oven that can generate temperatures between 215°F (102°C) to 325°F (163°C). 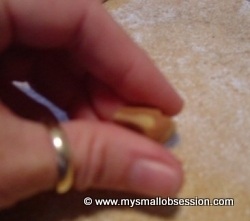 Mix the Carmel and Orche colored clays together until blended. 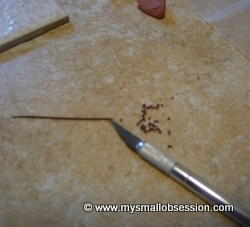 Gently roll the "chips" into the blended clay, don't handle too much, just get the chips mixed in. 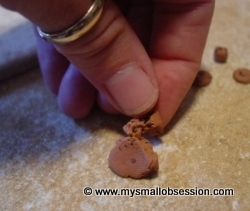 Carefully shape small pieces of clay into balls and gently press down, making sure that the "chips" are visible. 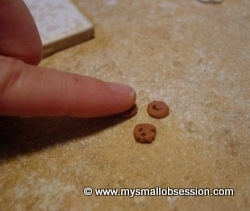 Use a toothbrush or sandpaper to gently texture your cookies. Bake for 15 - 20 minutes at 250°F, depending on your oven. 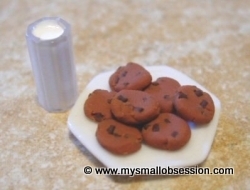 Add a miniature glass of milk and enjoy!